These days, the professional orchestra world is characterized by unparalleled technical skill, dutiful attention to historically-informed performance practice, and a general homogenization of sound and style. Musicians are expected to transition, instantly and seamlessly, from the lush Romanticism of Tchaikovsky to the lean purity of Mozart, with the mixed meters of Stravinsky and John Adams thrown in for good measure. In many ways, it’s the best of times. Perhaps what has been lost, however, is the instantly recognizable “sound” of a particular orchestra. Go back and listen to the historical recordings of the Philadelphia Orchestra and you’ll hear this kind of distinct “sound.” It was the shimmering warmth, intensity, and depth of the strings that formed the bedrock of what came to be known as the “Philadelphia Sound.” It began under Leopold Stokowski (music director from 1912 to 1936), who experimented with unconventional seating of the orchestral sections, and free (unsynchronized) bowing “to produce a pulsating sound.” Stokowski even marked the phrasing differently in each part to create “a continuous, seamless sound.” The “Philadelphia Sound” continued to develop under Eugene Ormandy (music director for a staggering forty-four years from 1936 to 1980), who occasionally doubled the second violins with violas for increased richness. There are theories that the extra-lush sound developed as a way to combat the punishingly dry acoustics of the Academy of Music, the orchestra’s longtime home before the opening of the Kimmel Center in 2001. But a larger concept of sound was also clearly at work. Stokowski and Ormandy both conducted in a way that avoided sharp edges and encouraged a relaxed sense of opulence. Stokowski famously avoided using a baton, instead sculpting the music with his hands. Perhaps no recording demonstrates the soulful warmth of Ormandy’s Philadelphia string section more clearly than this 1961 recording of the Nocturne from Alexander Borodin’s String Quartet No. 2. 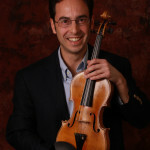 This excerpt includes brief solos by the orchestra’s principal players, including legendary concertmaster Norman Carol. UPDATE: An attentive reader pointed out that the solo is likely played by Carol’s predecessor, Anshel Brusilow. The next excerpt comes from Ormandy’s 1969 recording of Mahler’s First Symphony. This performance includes the rarely-heard “Blumine” second movement, which Mahler cut from the Symphony. I’m going to “drop the needle” at an extraordinary moment in the middle of the third movement. The sardonic huntsman’s funeral march is fading into the distance and we find ourselves in a serenely beautiful new world. Here, Mahler drew upon “Die zwei blauen Augen“ from Songs of a Wayfarer. To make records with the Philadelphia Symphony Orchestra is as thrilling an experience as any artist could desire. Unquestionably, they are the finest orchestral combination in the world: even the famous New York Philharmonic, which you heard in London under Toscanini last summer, must, I think, take second place. Here is Stokowski’s famous orchestral adaptation of Bach’s Toccata and Fugue in D minor. It’s music which pulls Bach firmly into the twentieth century, taking on a new, monumental quality. If the Borodin is that far back, isn’t the soloist Anshel Brusilow. You might be right. I see that Carol was concertmaster between 1966 and 1994. This album is dated 1961. Thank you, Timothy Judd, for these magnificent memories and your insightful comments. Ormandy and the Fabulous Philadelphians had a profound influence on me as a young conductor-composer. Ormandy invited me to come to Philadelphia several times to observe rehearsals and hear concerts…unforgettable! And I took every opportunity I could to hear them on tour. The combination of gorgeous sonority and blazing technique, always put to such expressive purpose, put them in a class unto themselves. BTW, Ormandy, too, conducted without a baton until just the last few years. I never dreamed that one day I would compose for this great orchestra, but in a few weeks Jeffrey Khaner and the Orchestra will premiere my new Flute Concerto. Can’t wait! Thank you for sharing your insight and congratulations on the premiere of your new Concerto! Thanks, Timothy…and thanks again for this article! I find quite a vast difference between the Stokowski sound and the Ormandy sound. Stokowski’s was relatively leaner, but as varied in color as the greatest concert organ. Ormandy made it plush, velvety, the famous sound that is so sadly lost now. Ormandy made numerous changes to composer’s scores. The Philadelphia Sound was very much planned. I spent two years writing a book on the subject.